Most working Americans spend their lives planning for retirement, but even smart, diligent folks can forget to account for certain expenses or underestimate how much they’ll need. As a result, some people have to change their retirement plans just to make ends meet. See how your financial plan stacks up: Based on insights from financial planning experts combined with firsthand accounts from our residents, we’ve compiled a list of the top five hidden expenses people wish they hadn’t forgotten during retirement planning. Does your retirement budget account for these common costs? Many people assume Medicare will pay for all the care they need in retirement, but with several gaps in drug coverage and routine care, Medicare recipients find themselves covering more expenses out of pocket than they initially anticipated. Part B covers about 80 percent of routine and preventative care but doesn’t contribute to check-ups or treatments for common care needs like dental, vision and hearing. To continue getting dental check-ups and eye exams when you’re over 65, you’ll need to add Medicare Advantage (Medicare Part C), a supplemental plan offered through private insurers. Even though Part C is optional, and comes with added premiums, few older adults can afford to exclude the important coverage it provides. More than 90 percent of folks in their 50s require corrective lenses and about a quarter of people aged 65 to 74 have dental disease classified as severe. And if you’re one of the 48 million Americans with hearing loss, you’ll need to budget accordingly for hearing aids and associated costs; Medicare Advantage will only cover part of the cost of a hearing aid, which can cost anywhere from $2,300 to well over $20,000. Apart from out-of-network expenses, it’s important to set aside flexible savings to cover premiums and coinsurance and accommodate for inflation. 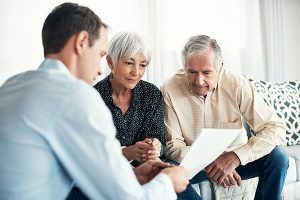 In 2018, Fidelity estimated couples retiring at age 65 would need $280,000 in savings just for medical and healthcare costs—a number that has steadily increased since their first report in 2002. Housing costs are often the single largest monthly expense for people of any age. Even if you own your home, increasing property taxes and home maintenance costs can make it difficult to predict financial needs in the long-term. While most people hope to see their property values go up, this can be a big problem for retired folks on a fixed income. As the profile of your neighborhood grows, so do property taxes. Although property taxes rarely take a sharp, unforeseeable turn, they can mount up to a significant expense and deferral is not guaranteed for all retirees. The cost of home maintenance is another unanticipated financial burden some homeowners fail to plan for. It’s recommended that you set aside 1 to 4 percent of your home’s value each year to cover the cost of replacing a roof, heating system or other possible expenses. This still may not be enough to pay for possible remodeling projects to make your home safer, like updating flooring choices to have more traction or adding to your electrical system for more indoor and outdoor lighting. For those already considering downsizing to a condo or apartment, mandatory Homeowner’s Association (HOA) rules—and their associated fees—can be difficult to live with. While The Avenues at Crofton Park doesn’t charge its residents HOA fees, some developments do impose an additional fee to cover community upkeep. These expenses aren’t always regulated, either, since some HOAs lack the appropriate reserve funding to pay for large projects like installing a new HVAC system or elevator. If you’re considering moving to a development that charges HOA fees, make sure to review the fine print prior to making a commitment. We love our families more than anything, so it’s no wonder we want to be there for them always. Whether its spoiling them rotten with gifts or footing the bill on life’s big expenses, forgetting to include non-necessities in financial planning may catch up with you later. As problems with the economy have made it harder for younger generations to afford everyday living, it’s become more common for young people to turn to their parents for help. This can put a strain on grandparents, too, who are increasingly being asked to dip into their rainy-day funds to help their family avoid dire situations. Apart from these more significant investments, general gift-giving can get expensive. No one wants to miss seeing their loved one walk down the aisle but traveling to a destination wedding or sending the bride and groom something off their registry might not have been a line item in your retirement fund. There’s no need to skip the celebration or live on a shoestring budget for months leading up to the reception. Instead, try to set aside some modest savings to spend on your loved ones later. The average retiree spends about $197 on monthly leisure costs, which is a manageable price tag for keeping busy. But, if you were planning on doing more in retirement, like traveling the world, getting your pilot’s license or restoring a vintage car, you’ll need significantly more than a couple hundred bucks to make your dream come true. Not everyone has such grand plans, but for those who do, you’ll need to talk with a financial planner to ensure your retirement funds and any other income sources are enough to tackle things on your bucket list without coming up short on cash later in retirement. Because it’s difficult to imagine needing assistance with things we’ve been doing our entire adult lives, it’s common to under-plan for the cost of long-term care needs. Breakthroughs in modern medicine and preventative care are leading to longer, happier lives. We have more centenarians than ever before, and more people are enjoying fulfilling lifestyles well into their 70s, 80s and 90s. However, there’s one caveat to consider: necessary funds to accommodate your longer lifespan. The savings plan you had for a 20- or 25- year retirement may end up getting stretched over more than 30 years or get reallocated to accommodate sudden changes in medical costs. Although Medicare Part A and B will help with any acute care, like short hospital stays or even skilled nursing needs, it may not contribute to private in-home care after the fact. Should your care needs change, either suddenly or slowly over time, it will be necessary to understand what you can afford in the long term. This is a highly unpredictable expense, with no way to know if it will ever apply to you or your spouse, but just because it seems unlikely doesn’t mean you shouldn’t be prepared. Additionally, if at some point you have to adapt your home to meet accessibility needs (e.g. adding a ramp, lift or fixtures, widening doors, etc. ), that can be a significant expense as well. One thing you can do in early retirement to defray future costs is invest in long-term care insurance. The younger you are when you invest, the more likely you’ll be to get approved and secure a discount on premiums. Retirement is full of surprises, but with a little forethought and planning, retirement expenses don’t have to catch you off guard. We wish you health, happiness and independence during your golden years.